Last post I promised to translate the captions from La Lingère in M. Panckoucke's Encyclopédie Méthodique. Voilà: herewith a translation of the captions for plate 1. Let us waste no time on preludes, except one: I am not nearly the French translator that Cassidy is over at A Most Beguiling Accomplishment, and admit so candidly. Dictionary consulted when necessary: Mr. A. Boyer, The Royal Dictionary, French and English, and, English and French..., 1764. Another version, French, 1729. Edit, 02/12/13: Kind corrections/explanations provided by Cassidy. Thank you! Match the "fig" (figure) numbers to those shown on the plates, and you're in business. I've blown up the labeled parts of each of the two plates. Here's the upper half of the captions for plate one. I divided the image of the caption text into two parts, for easier matching between image and text. Look at the left column only. 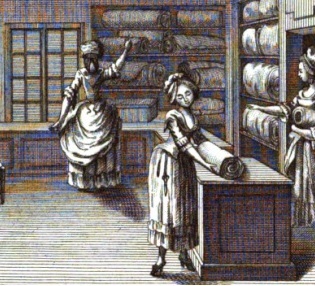 Vignette representing the boutique of a lingère. Fig. 1, the whip stitch. Fig. 2, the side stitch, serving to make a hem. Fig. 3, the back stitch. Fig 5, manner of making a folded (turned down)[rabattue] stitch to join two pieces without selvage (border) [lisière], or of which one one piece has one (a selvage). d c, are the stitches front and back at which one begins to unite the two pieces; a, a, is the protuding edge [excédent] of the selvaged piece which one brings down (presses down) on b b, in which to sew with side stitches (hemming stitches), in order to hide the d c stitches. If the piece has no Si la piece a a has no longer any selvage, one makes there a little "turn down" [rempli]. Fig 6, the blanket stitch, or lockstitch. Fig 7, the cross stitch. Here's the bottom half of the caption text for plate one...in the left-hand column. Fig. A, cut (pattern piece) of a slipper; a, the upper of the foot represented by d, before it is cut slopingly (cut ballow); b the under-piece. Fig. C, an assembled (literally "mounted") cap; a a, the ruffles (literally "butterflies"); b b the beards (wattles, whiskers); d d the bottom (the ground). Fig. D, the pieces of a headdress (coif); p, the ruffles; b full beard [I take this to be a lappet]. Fig. F, a large [sleeve] ruffle, pleated and mounted on its ribbon. Fig. 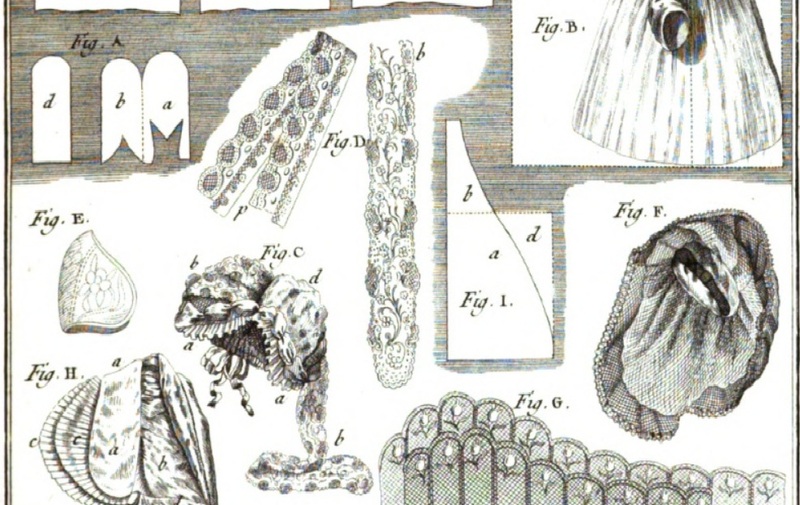 G, two rows of [sleeve] ruffles, neither sewn [directly to the garment] nor mounted [sewn to a tape and basted to a gown]. Fig. H, a round cap; a a, the channel; b, the bottom (ground, base); c c, the muslin which creates the "bat-the-eyelid" [Generally the term means "I don't care", a wink, a little nothing. There are other, scatological meanings to the term, but let's leave them alone. ]; d, the channel (groove) where one passes the ribbons. Now please see the top two lines of the second column, shown in the first text image. Don't you love the idea of ruffles as butterflies, and lappets as beards? Evocative. Please take particular note of the unmounted sleeve ruffle. It seems to be pure lace, the design ideal for a graduated, narrow-to-wide ruffle. There you go. Next time, plate 2. By the way, I am on the mend -- again. A day or so after the last post I came down with sepsis from a medical device used post surgery. Had a number of desperately ill days in the hospital. Now am home and on intravenous antibiotics and feeling stronger daily. Thank Heaven for family, friends, and prayers! As a result of all the excitement, stress, and what have you, there are some changes on the way for the costuming I do, and for this blog. Am still mulling everything over, but have about made up my mind. Until next post, be well, everyone. Something that's "mounted" is assembled. "Papillons" are the ruffles at the brim, and a "rang" is a row. "Cousu" is the past participle of "coudre", to sew - a cousu ruffle is sewn to the shift/gown while a mounted one is on a tape and basted to the gown. In fig. I, you cut out d and bring it over to be b.
I'm so glad you're feeling better! That's awful. Rest up, and get well soon.